Statutes on “proportional liability,” where defendants only pay for the damage they actually cause (The Colorado Chamber strongly opposes any effort to return to the law of “joint and several liability,” which was repealed in 1986). Efforts to erode the right of employers to conduct background checks on job applicants. Giving employers more legal leverage to recover company property. Opposes bills or resolutions that propose to give local governments the authority, and in some cases the specific direction, to enact environmental laws that are more stringent than or in some other way inconsistent with state regulations promulgated in the areas of air quality and water quality. Opposes legislation to aggressively reduce carbon emissions (i.e., “carbon tax,” “cap and trade”) without an accurate assessment of cost and benefits as well as consideration of technological capabilities for mitigating the impact on carbon-intensive industries, which will have a negative impact by driving up energy costs to all consumers, discouraging economic growth in Colorado and driving jobs to other states. The Colorado Chamber opposes measures in the Colorado General Assembly that would unduly burden Colorado employers with worker-verification systems that are underfunded or unworkable. This opposition includes bills requiring businesses to use the Federal “Basic Employer Verification Pilot Program” to determine worker-eligibility status. Adequately funds and makes workable any Federal worker-verification systems that employers are required to use. In addition, The Colorado Chamber opposes bills or amendments that impose civil liability on an employer for the off-duty conduct of any worker who is found to be an illegal immigrant. The Colorado Chamber promotes the benefits of a market-driven health-care system that recognizes that employers voluntarily provide employees with high quality, affordable medical benefits. The Colorado Chamber opposes new governmental mandates on employer-provided health-care benefits that inevitably increase the cost of health-care insurance for Colorado businesses. Opposes the weakening of ERISA by Congress. The Colorado Chamber opposes measures that seek to repeal or weaken the position of private-sector employers under the Colorado Labor Peace Act. This 63-year-old Colorado law sets forth a state-government process for “All-Union Agreements” that establish a “union-shop” in a particular business. The state-administered election requires 75 percent of the workers actually voting to support the All-Union Agreement before an employer can be forced to implement it. The Colorado Chamber also opposes legislative proposals that would prohibit an employer from requiring their workers to attend or participate in a meeting or any other communication where the management expresses their views against a union-organizing effort. At the Federal Government level, The Colorado Chamber opposes efforts in Congress to allow union organizers to use the “card-check procedure,” rather than the secret ballot now required by the National Labor Relations Act. For businesses, Colorado is a moderate-taxing state. Although constitutional enactment of tax policy limits state governmental flexibility, it protects businesses from legislation that taxes only businesses when legislators think they need more revenue. 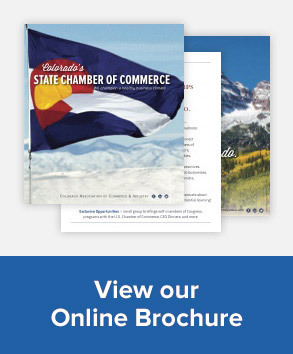 Although The Colorado Chamber has for many years argued for the eventual elimination of the local business personal property tax, The Colorado Chamber also recognizes that the replacement of about $600 million in business personal property tax revenues received by local governments will require a major overhaul of the complex, interconnected yet contradictory statutory and constitutional parameters of Colorado’s tax system. Supports laws and regulations giving the same rate of interest for the over-payment of taxes as for the under-payment of taxes (The Colorado Chamber therefore opposes legislation that provides for a lower rate of interest for over-payments and a higher rate for under-payments). Efforts to establish an “alternative base period” for unemployment insurance. Each legislative session, The Colorado Chamber fights to protect the 1991 reforms, which it believes are fair and balanced, from proposals that would drive up the costs of the workers’ compensation system and, ultimately, the insurance premiums paid by businesses, which solely fund the system. In 2003, for example, The Colorado Chamber saved workers’ compensation insurance providers up to $13 million annually by working to defeat one bill and to pass another. The Colorado Chamber consistently opposes bills and amendments that would allowed injured workers to select their own physicians or other health-care professionals. The Colorado Chamber also opposes efforts to significantly change the administrative system established by the 19991 reforms that would weaken employers’ rights either in favor of the Administrative Law Judges, who hear the claims, or the lawyers for the injured workers.